U.S. President Donald Trump meets with Palestinian President Mahmoud Abbas during the U.N. General Assembly in New York, U.S., September 20, 2017. NEW YORK - Palestinian President Mahmoud Abbas expressed optimism on Wednesday about reaching a peace agreement with Israel this year and said U.S. President Donald Trump’s commitment to the issue would help create the “deal of the century” in the region. Abbas met Trump on the sidelines of the U.N. General Assembly gathering of world leaders in New York and thanked him for his support. “If this is any proof to anything ... it attests to the seriousness of your Excellency, Mr. President, to achieve the deal of the century in the Middle East during this year or in the coming months, God willing,” Abbas said through an interpreter. Trump said his team of advisers was working very hard on the issue, as were Israel, Saudi Arabia and other nations. “I think we have a very, very good chance, and I certainly will devote everything within my heart and within my soul to get that deal made,” Trump said. “We’re at a very important juncture, there’s a small period of time, and we’re going to see what we can do. There can be no promises, obviously,” he said. 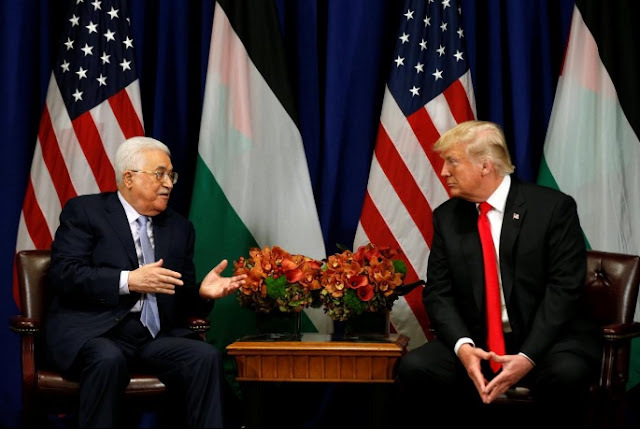 Abbas noted that the Palestinians had met with Trump’s team more than 20 times since the U.S. president entered office in January, and he said the fact that Jews and Muslims were celebrating a new year was a positive sign. “This is a very sweet coincidence that we can celebrate the new year together within a 24-hour period, and if this is an indication to anything, it means that we can coexist peacefully together,” Abbas said. Later at the U.N. gathering, Abbas urged the 193-nation body to end the “Israeli occupation of the state of Palestine” within a set timetable. He also borrowed a campaign line of Trump‘s, using the phrase “draining the swamp” as an argument for addressing the conflict between Palestinians and Israelis. Trump used a similar phrase as a presidential candidate to criticize politicians and policy making in Washington. “Beyond any doubt, draining the swamp of colonial occupation of our land and ending its unjust, oppressive and illegal practices against our people would greatly affect the fight against terrorism, depriving terrorist groups of one of the key rallying cries they exploit to promote their repugnant ideas,” Abbas said in his prepared remarks. Trump met with Israeli Prime Minister Benjamin Netanyahu earlier in the week. The Israeli and Palestinian leaders both went out of their way to praise the U.S. president. The White House played down both meetings in terms of their significance toward peace talks on one of the world’s most intractable conflicts that has defied the peacemaking efforts of several U.S. administrations going back decades. The Palestinians seek to establish an independent state in the Israeli occupied West Bank, territory captured in the 1967 Middle East war and the Gaza Strip, with East Jerusalem as its capital. The Palestinian Authority said in a statement Abbas told Trump that “peace can be achieved through implementing the two-state solution based on the 1967 borders.” Abbas also said “the illegal Israeli settlements policy poses an immediate threat” to that. Abbas’ insistence on a return to 1967 pre-war borders is something Israel has repeatedly rejected. Palestinian President Mahmoud Abbas expressed optimism on Wednesday about reaching a peace agreement with Israel this year and said U.S. President Donald Trump’s commitment to the issue would help create the “deal of the century” in the region.